Have You Ever Seen this Stamp Before? The box was in miserable state. 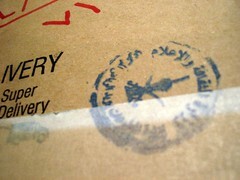 However, it is not the Saudi Post Service that is to blame here; actually, it is the so-called ministry of information. Apparently the censorship unit at the ministry had some curiosity regarding the content of the box, so they shamelessly and brutally opened it up, and after finding nothing dangerous inside they did not have time to return to its original state. Moreover, they have proudly stamped their logo on the box. I think my friend can now feel very comfortable when he reads the books knowing that they were approved by the ministry, or can’t he? Mine looked even worse !! I received it in a blue bag that looked like “5eshat al 3esh” and one book was missing “While Europe Slept: How Radical Islam is Destroying the West from Within” .. They left me a note saying that I could reclaim the book back bs I never did .. I couldn’t find their office !! I can’t believe that they hire ppl to just sit and read books o la in English ba3ad !! Same thing when I get packages from Saudi to the states, but I’m not fortunate enough to get a stamp of approval. but they’re replacing it so all is good, just means i have to wait longer *sighs* i feel like burning jarir, they should be able to get the books for us but nooooooo ah well. 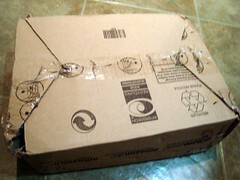 I always buy from amazon.com, but it never came looking like the pictures you showed. It’s also alot cheaper to buy from amazon via aramex. Another advantage is that with aramex you can buy products that are only for sale in the US. Ps I’m not saying that my packages always come untouched. 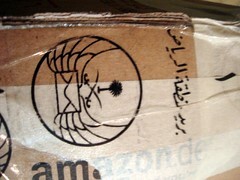 Sometimes Saudi customs tear the box open. well thats y i sue a relative in Dubai to have all by amazon.com packages delivered and then i get them whenever i have time to drive down there. Well, at least he got all of the items. The MoI is notorious for taking items they “disapprove of”. Sad how all of these awful material always ends up in the houses of MoI staff. did your friend get the package from hell? I think the box looks good, considering what has come to us from book stores. I have had books confiscated and no , not one note. So I used my womanly brain and got a p.o box in Bahrain :) I can get anything I want now and no problem. WHATS HAPPENED TO FOUAD AHMED AL FARHAAAAAAAAN?????????? Well, considering the current situations back here, people got to be careful what goes in through mail. But still this doesn’t give any body the right to miss up my stuff like this, in the name of national security. I believe we should keep writing, expressing and commenting.. People in position, and not just big guys, tend to refrain when they feel watched! You guys are screaming about nothing. This type of screening happens everywhere. Even here in Australia. 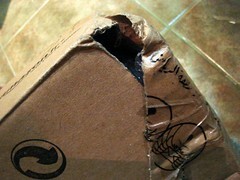 I ordered some books from overseas, and the customs people did the same thing. So whats up with the super judgemental approach to your system? have you seen what goes on outside, or is that that the grass is always greener on the other side?